Pumpkin seed oil is extracted from the unhusked seeds of a pumpkin (Cucurbita pepo). The oil is widely consumed in parts of Eastern Europe, where it has been made traditionally for the last 300 years. Many varieties and subspecies of pumpkin yield this fragrant oil. Pumpkin seed oil is a food staple in countries like Croatia, Slovenia, Hungary, Romania, and the Styria region of Austria. Locals drizzle the oil on salads, desserts, and soups for an added nutty flavor. The oil’s color changes depending on the thickness of the amount used. A thin layer may appear dark green, while thicker layers appear to be deep red. However, the oil acquires a bitter taste when it begins to brown. There are many pumpkin seed oil benefits for the body as it contains nutrients like essential fatty acids and traces of some vitamins and minerals. The oil has a range of culinary and medicinal uses and is available in large parts of the world these days. The oil is beneficial when both applied topically and ingested. Pumpkin seed oil contains 120 calories, healthy fats, and small amounts of minerals and vitamins. Even though pumpkin seeds contain carbohydrates, the oil itself does not contain any carbohydrates. The fats in pumpkin seed oil are “good” fats and are mostly polyunsaturated fats like omega-3 and omega-6 fatty acids. These fatty acids help in lowering your LDL (bad) cholesterol and preventing heart disease. Nutritionists recommend that you obtain three percent to 10% of your daily calorie intake from polyunsaturated fat. The monounsaturated fats in pumpkin seed oil help to increase your HDL or “good” cholesterol levels. When it comes to dietary fat, in 2014, the Academy of Nutrition and Dietetics suggested getting 15% to 20% of your daily calories from monounsaturated fat while avoiding trans and saturated fats. Pumpkin seed oil is rich in antioxidants, zinc, magnesium, and fatty acids, which makes it beneficial for your heart. According to a 1997 study on cholesterol-fed rabbits, published in Pharmacological Research, when given with the drug simvastatin, pumpkin seed oil may decrease high blood pressure and high cholesterol levels. A 12-week study of 35 postmenopausal women, published in Climacteric, showed that pumpkin seed oil supplements reduced diastolic blood pressure by seven percent and increased HDL or “good” cholesterol levels by 16%. According to a 2012 study, published in the Journal of Medicinal Food, pumpkin’s ability to increase nitric oxide generation in your body may have beneficial effects on your heart health. This is because nitric acid helps expand blood vessels, which improves the blood flow and also reduces the incidence of plaque in your arteries. Pumpkin seed oil is a type of diuretic. It stimulates the release of excess water and salt stored in your body by increasing urine production, thereby reducing pressure on your bladder. It could also relieve the burning sensation that you may sometimes feel when you are urinating. It’s also thought to prevent the formation of kidney stones. These benefits may be seen whether you ingest pumpkin seed oil or apply it topically on your lower abdomen through an oil massage. It is also known to reduce the incidence of bed wetting in young children. A poor diet is a major contributor to diabetes. Many experts believe that type 2 diabetes can be managed and even treated with the right diet strategies. According to a 2014 research study, published in Critical Reviews in Food Science and Nutrition, the oil from ungerminated pumpkin seeds can lower blood sugar. Hence pumpkin seed oil may be a worthwhile addition to any effective diabetic diet plan. According to a 2015 study published in the journal PLoS ONE, ingesting pumpkin seed oil is beneficial for people suffering from non-alcoholic fatty liver disease (NAFLD). It contains a healthy amount of unsaturated fats, which weaken the development of NAFLD. 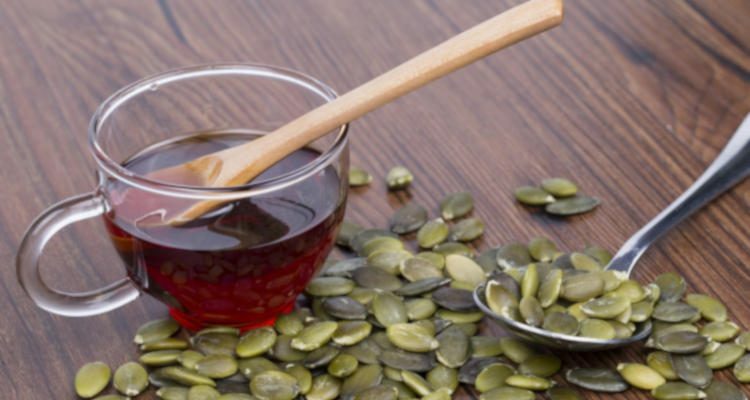 Researchers believe pumpkin seed oil improves cholesterol and triglyceride levels and reduces vascular inflammation, which reduces the effects of NAFLD. The benefits of pumpkin seed oil for maintaining a healthy prostate have been well-studied and documented. Research suggests the oil offers protection against prostate cancer and is effective in reducing the size of an enlarged prostate, especially in cases of benign prostatic hyperplasia or age-related prostate enlargement. A 2009 study of Korean men with symptomatic benign prostatic hyperplasia found that the patients’ symptoms were reduced after they consumed 320 milligrams of pumpkin seed oil and saw palmetto oil each day for six months. Some anecdotal evidence suggests that pumpkin seed oil can reduce depression and brighten your mood with regular use. It may work by lowering the stress hormone levels in your body. To take advantage of this amazing health benefit of pumpkin seed oil, some use it topically by applying the oil to their temples, neck, or chest. If you have arthritis, try adding a single teaspoon of pumpkin seed oil to your diet. It may have a significant effect on arthritic pain in your joints. The antioxidants in pumpkin seed oil are said to function like non-steroidal anti-inflammatory drugs, preventing the free radicals from damaging your body. It can also reduce inflammation. In 2014, a study was conducted to investigate the efficacy and tolerability of pumpkin seed oil in men with mild to moderate androgenetic alopecia (AGA). AGA is a kind of hair loss known to happen in both men and women after puberty. This study published in Evidence-Based Complementary and Alternative Medicineshowed that pumpkin seed oil supplement over 24 weeks had a positive anabolic effect on hair growth, and this was due to the possible effects of 5-reductase inhibition in the patients with a mild to moderate male pattern hair loss. The study concluded that pumpkin seed oil should be looked at as a potential alternative treatment. The fatty acids, antioxidants, and zinc in pumpkin seed oil are beneficial for your skin as they help to retain moisture and also protect your skin from external stress agents. The fatty acids keep your skin hydrated for longer periods of time and also balance out the dry areas of the skin. Antioxidants protect your skin and also act as anti-wrinkle agents. The zinc in pumpkin seed oil fights off bacteria and dirt that has built up on your skin, therefore neutralizing the primary cause of acne breakouts. Do not heat pumpkin seed oil or else you will lose all the therapeutic ingredients and the flavor as well. Instead of using the oil for cooking or frying dishes, most add it to foods just before they are consumed. You can use pumpkin seed oil as a marinade or dressing ingredient in salads. It acts as a natural flavor enhancer in creme soups and spreads. You might be pleasantly surprised to know that the oil suits sweet foods as well. Two such popular dishes are fried banana with pumpkin seed oil and vanilla ice cream with pumpkin seed oil. Pour all the ingredients into a small bowl. Mix with a fork until thoroughly blended. Sprinkle some toasted pumpkin seeds on top of any salad. Grease and flour a bundt pan and sprinkle pumpkin seeds in the bottom of the pan. Slowly beat the egg yolks, water, powdered sugar, vanilla extract, and toasted pumpkin seed oil with an electric mixer. In a different bowl, whisk the egg whites and granulated sugar until firm to stiff peaks develop. Add 1/3 of the egg whites and half of the sifted flour and baking powder to the cake batter and fold until they are well incorporated. Then fold in the rest. Pour everything into the pan and bake for 50 minutes. You can serve the cake with a dusting of powdered sugar or a scoop of vanilla ice cream, drizzled with extra toasted pumpkin seed oil. Pumpkin seed oil can be consumed in food dishes or as a supplement in liquid or concentrated pill form. The pill form is the more popular supplement because it’s easier to swallow and handier. You can buy it in 1,000-milligram dosages from your nearby grocery store or supermarket. You can also buy it from online stores, e-commerce websites, or a health retailer. We get pumpkin seed oil by pressing the unhulled seeds of pumpkins. Even though pumpkin seed oil is primarily made in the countries of Eastern Europe, it has become popular and is available in many parts of the world today. Pumpkin seed oil is very healthy for your body because it contains unsaturated fatty acids, vitamins and minerals, and antioxidants. Potential pumpkin seed oil benefits include prevention of heart disease, improving prostate health, providing relief from an overactive bladder, relieving arthritic pain, encouraging mental well-being, managing blood sugar, helping in male pattern hair loss, keeping skin acne free, and weakening the effects of NAFLD. You can use pumpkin seed oil to make wonderful dishes like pumpkin seed oil dressing and pumpkin seed oil cake. Just be careful not to heat it because doing so will degrade its medicinal properties and taste. The goodness of pumpkin seed oil is increasingly appreciated all over the world. It’s about time you joined the party as well! https://oilhealthbenefits.com/pumpkin-seed-oil/, last accessed November 21, 2018. Staughton, J., “9 Amazing Benefits Of Pumpkin Seed Oil,” Organic facts, April 5, 2018; https://www.organicfacts.net/health-benefits/oils/pumpkin-seed-oil.html, last accessed November 21, 2018. “Full Report (All Nutrients): 45254585, ORGANIC PUMPKIN SEED OIL, UPC: 749544012123,” USDA, July 2018;https://ndb.nal.usda.gov/ndb/foods/show/45254585?fgcd=&manu=&format=&count=&max=25&offset=&sort=default&order=asc&qlookup=pumpkin+seed+oil&ds=&qt=&qp=&qa=&qn=&q=&ing=, last accessed November 21, 2018. Edwards, R., “Pumpkin Seed Oil Benefits Prostate & Heart Health,” Dr. Axe, October 28, 2018; https://draxe.com/pumpkin-seed-oil/, last accessed November 21, 2018.
https://www.verywellfit.com/pumpkin-seed-oil-benefits-and-nutrition-facts-4164301, last accessed November 21, 2018.
https://www.ncbi.nlm.nih.gov/pubmed/24342605, last accessed November 21, 2018.
https://www.ncbi.nlm.nih.gov/pubmed/9299202, last accessed November 21, 2018.
https://www.ncbi.nlm.nih.gov/pubmed/21545273, last accessed November 21, 2018. El-Mosallamy, A., et al., “Antihypertensive and cardioprotective effects of pumpkin seed oil,” Journal of Medicinal Food, Feb. 2012;15(2):180-9 https://www.ncbi.nlm.nih.gov/pubmed/22082068, last accessed November 21, 2018. Adams, G., et al., “The hypoglycemic effect of pumpkin seeds, Trigonelline (TRG), Nicotinic acid (NA), and D-Chiro-inositol (DCI) in controlling glycemic levels in diabetes mellitus,”Critical Reviews in Food Science and Nutrition, 2014;54(10):1322-9; https://www.ncbi.nlm.nih.gov/pubmed/24564589, last accessed November 21, 2018.
https://www.ncbi.nlm.nih.gov/pmc/articles/PMC4017725/, last accessed November 21, 2018. Morrision, M., et al., “Replacement of Dietary Saturated Fat by PUFA-Rich Pumpkin Seed Oil Attenuates Non-Alcoholic Fatty Liver Disease and Atherosclerosis Development, with Additional Health Effects of Virgin over Refined Oil,” PLoS One, Sep. 2015; https://www.ncbi.nlm.nih.gov/pubmed/26405765, last accessed November 21, 2018.
https://journals.plos.org/plosone/article?id=10.1371/journal.pone.0139196, last accessed November 21, 2018.
https://theidleman.com/manual/life/grooming/how-pumpkin-seed-oil-is-beneficial-to-your-skin/, last accessed November 21, 2018.
https://www.pumpkinseedoil.cc/pumpkin-seed-oil-blog/tips-for-cooking-with-pumpkin-seed-oil, last accessed November 21, 2018.
https://www.geniuskitchen.com/recipe/pumpkin-seed-oil-dressing-127650, last accessed November 21, 2018.
https://latourangelle.com/recipes/pumpkin-seed-oil-cake/, last accessed November 21, 2018.
https://www.healthline.com/health/pumpkin-seed-oil, last accessed November 21, 2018.